Hotel Flamenco, opened in 1983, is located on the green Buda side of the Danube but still close to the city centre, only a few minutes away from the business and shopping districts of the capital. It's easy to reach from the Budapest-Vienna motorway. Danubius Park Hotel Flamenco is situated in a quiet residential area overlooking a beautiful park with a small lake and surrounded by the scenic hills of Buda. The Comprehensive Courtesy of Choice programme is used by the hotel. Green Hotel 2001. Hotel Flamenco has 358 rooms: 346 double/twin rooms, 4 triple rooms and 8 suites. There are 105 non-smoking rooms of them. Air-conditioned rooms, each with bathroom (with bath or shower), minibar, direct dial phone, electronic key lock system, colour TV with pay movies and satellite programmes, TV information system, radio. Bolero Restaurant: fine-dining restaurant with international cuisine and Hungarian specialities. Salon music in the evening. 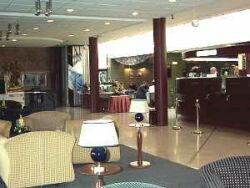 Club Drinkbar: pleasant lobby bar with own terrace and piano music. Daily "Happy Hours". Hotel Hungaria City Center Budapest **** Hungary's largest hotel in the centre of Budapest.